Spotlight on: Courses in the Bronx! The sun is out, the weather is warm, and the days are long - there's no season like the summer to take advantage of all that the city has to offer. And what better way to do so than with an ASPDP course that will enrich your instructional practice and give you new tools to take back to the classroom. Are you a Bronx-based teacher? Come take an ASPDP course conveniently offered in your borough! Join educators at the Bronx Zoo in this blended science and social studies course in a look back through history, examining what has influenced our relationships with predators. Gain knowledge about predators and their conservation while building skills to bring this information to your classroom through dynamic activities and differentiated instruction. Get hands-on in creating and modeling environmental dramas that will help inspire students of all ages to appreciate predators and help protect them. Looking for more? 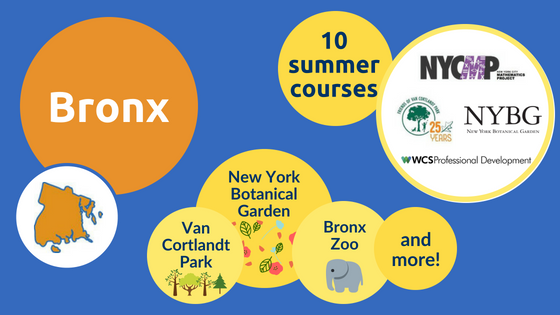 This summer, there are over 60 ASPDP courses taking place at museums, zoos and botanical gardens, non-profits, and other cultural institutions across four NYC boroughs and over 160 online courses open for registration through July and August - check them out in our catalog!